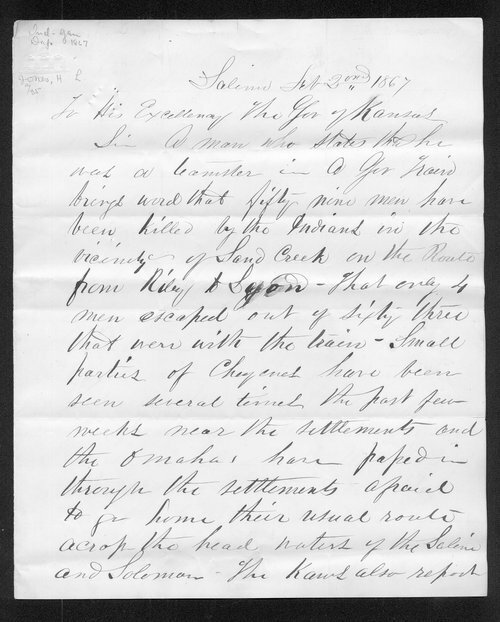 In this letter to Kansas Governor Samuel J. Crawford, H.L. Jones briefly discusses the activities of Indians around Salina, Kansas, including the fact that "larger bodies of hostile Indians near the frontier settlements" had recently been reported by friendly Kaw Indians. Jones recommends that Governor Crawford "enable an efficient force of mounted men from the militia to be called to the field if needed either to cooperate with the US forces or to act on the defensive on the frontier."